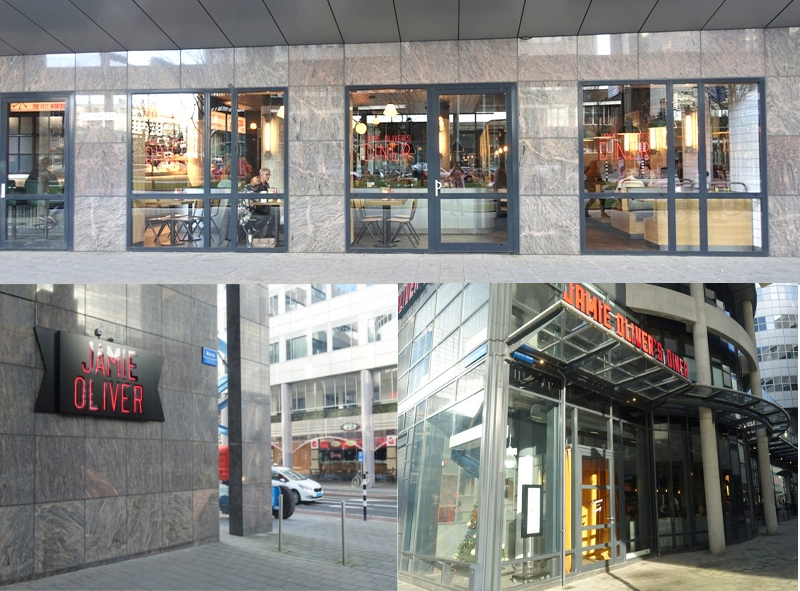 I was one of the select group of people who have gotten the opportunity to have lunch at Jamie's Diner in Rotterdam, the Netherlands, before the official opening on 18 December 2017. They were test running on 4 days and due to that, we got a 50% discount on all food. When you walk on the main street called the Meent, after a while, you will see the large windows in the picture at the top. In the picture at the bottom left, is a large Jamie Oliver sign and there is where you turn left. The entrance of the restaurant is at the back and you can see how the entrance looks like in the picture at the bottom right. You need to grab the door handle and push the door to the inside. The door is covered by heavy, yellow curtains and I think it is to keep the cold air out. I went there on a Sunday afternoon and it was quite crowded. Only a couple of tables were free. Just like at the Jamie's Italian restaurant in the Markthal, Rotterdam, there is a favorite place that I want to sit at. At the Jamie's Italian restaurant, it was at the rounded, leather bench with the tiles in the background, and at the Jamie's Diner, it is at the green leather benches in the center of the restaurant. I really like the open kitchen in the back, as you can see how your food is being prepared and when they are about to arrive to your table. Along the wall, there are 3 four person table booths, but the benches look nowhere as comfortable as the green benches in the center of the restaurant. 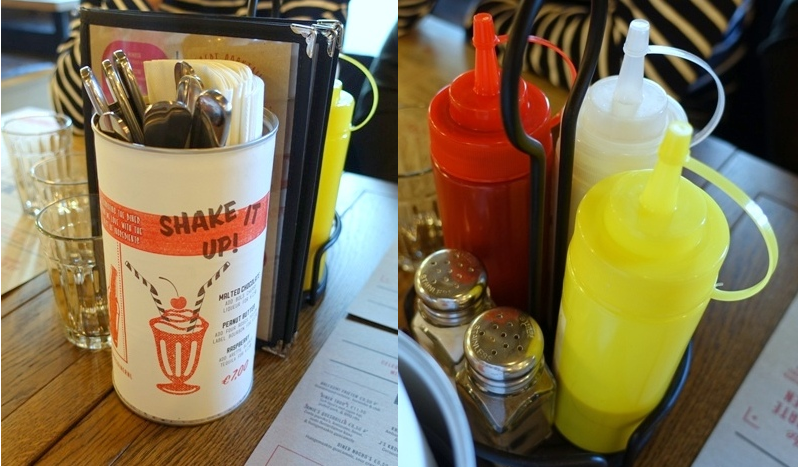 On the tables, you can already find the cutlery (forks and knifes), thick paper napkins, a plasticized drink menu booklet, and behind that, bottles with ketchup, mayonnaise, and mustard, and a salt and pepper shaker. The menu for the food is printed on the paper placemats. I really like this, as you can order more things or go for desserts, if you are still hungry (a bit difficult, when they take your menu's after ordering) and you can read what is in the dishes that you ordered, while you are eating it (Don't you sometimes want to know what a certain ingredient is?). It was quite cold outside, so two people ordered a hot cup of green tea and a hot cup of mint tea. I like drinking something cold (no matter what season it is), so I choose a glass of apple & vanilla spritz (one of the mocktails without alcohol). It contains apple juice, vanilla syrup, fresh lime and mint, and soda. You mainly taste the lime and mint with some sweetness coming from the fragrant vanilla syrup. The apple juice only adds a little sour end taste. Overall, it is very refreshing and thirst quenching. I like it a lot. 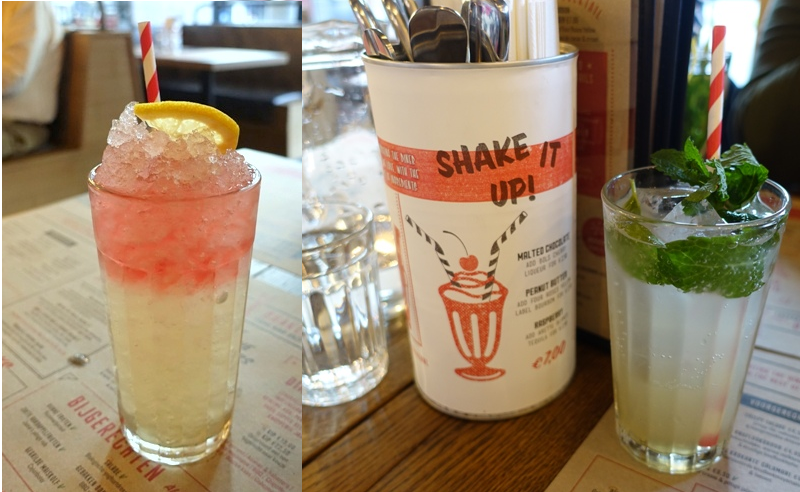 I recommended the refresher to someone else, as it was one of my favorite drinks at the Jamie's Italian restaurant. It was less pink than the refresher I had before, but it was still nice. The review on the food will be in the next blog post, as I took way too many pictures again.